10 3/4" x 6 1/4" leaf folded in thirds to form a printed program for "Rally Day'"at the Sunday School of the Congregational Church. 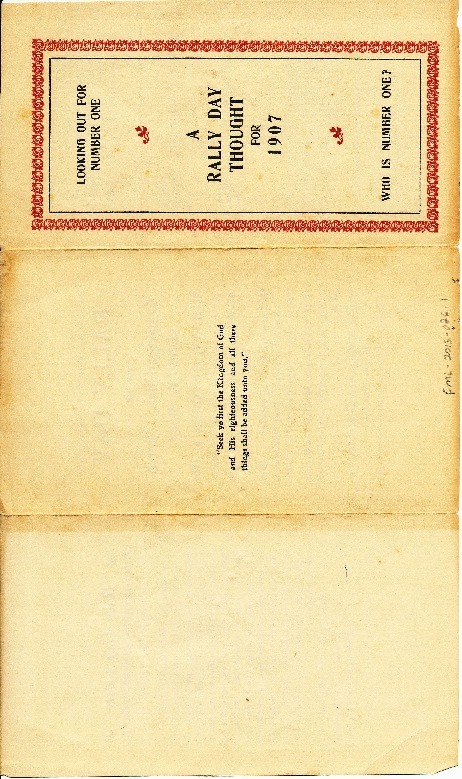 The first fold contains a prayer, the second a schedule of events for the day, and the third a letter and greeting from the Pastor and Superintendent. Congregational Church of Conway Mass. Congregational Church of Conway Mass., “Program for 1907 Rally Day at the Conway Congregational Church,” Conway Historical Society, accessed April 21, 2019, http://conwaymasshistory.org/items/show/953.